Do you know what makes you who you are? What makes you human? Is it the heart beating in your chest or your lungs filling and compressing as air rushes in and out of them. It could be argued it’s your brain, but your brain interprets sensory information from your body. If fed entirely different sensory information, would you still be you? The new Ghost in the Shell movie is set in a world where these questions are beginning to be encountered by humanity. Unlike the 1995 anime movie of the same name where cyborgs are fairly commonplace, Scarlett Johansson’s Major is the first of her kind. After her human body drowns, her brain is transplanted into an entirely robot body. Her new life as a super soldier begins but echoes of her past lead her on a journey of self identity and the search for truth. Ghost in the Shell is a visually stunning movie. It captures the spirit of the original anime movie with crisp and stark imagery but never crosses the line of incredulity. The future Tokyo bustles vibrantly with hologram adorned skyscrapers and busy streets. The cyber enhanced humans are elegantly and intricately designed and lend believability to the futuristic setting. It’s clear that director Rupert Sanders was a fan of the original movie as many scenes are copied frame by frame and majestically reproduced in live action. One scene in particular where Major is fighting in the water while cloaked in an invisible shell is artfully translated. In the original, Major has a constant shimmer around her body so that we can see her fighting. Sanders uses the water to create this effect, with splashes exposing Major’s physique as she flips and lands blows on her target. Aesthetically this movie is a feast for the eyes from beginning to end. Fans of the 1995 movie may be disappointed that the story is very different. While the setting inherently stirs philosophical questions, the plot is more Hollywood action blockbuster. I can’t fault the story on it’s own merits – it’s interesting, easy to follow and at times thought provoking and emotionally touching. It’s only when held against the original that it may falter but it’s fairer to call them different movies. The 1995 movie has moments of shocking realisation that invoke chills, while the sister scenes in this movie lack that heavy emotional impact. Conversely, the visuals and action scenes in the new movie reach greater heights and are more engaging. They’ve both powerful movies in their own right, but the expectations set by the original may disappoint some fans. 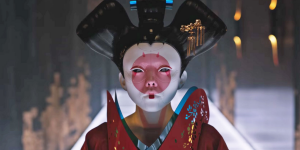 Ghost in the Shell hits so many high notes and as a stand alone movie I struggle to find fault in it, but fans of the 1995 anime shouldn’t go in expecting the same movie in live action form. It carves its own niche in the franchise. It’s a visually stunning movie with fast paced and thrilling action scenes, a believable and thought provoking futuristic setting and some genuinely touching moments. The story is satisfying with likeable characters and even a few surprises that take it a step above your average, Hollywood blockbuster. I give it a wholehearted recommendation.